If you are considering outpatient treatment for your child, please take a few minutes to review the following material for an idea of what sets Journey To Recovery apart from other programs and gives your child the best chance at treatment success. 1. Building a solid foundation for recovery. The Stages of Change Model is used to help young people monitor their progress as they move through the recovery process. The following video provides both an overview of the Stages of Change Model as well as how storytelling is used as a powerful tool for teaching about recovery. 2. Help for the entire family. The key to treatment success for families is learning how to respond appropriately to addictive behavior and setting healthy boundaries. The Journey Musical Recovery Program is a rock musical tells a story about overcoming addiction and finding a new life in recovery. Each song is used to examine specific aspects of the addiction-recovery process. The following videos show how the song Windowpane Night is used to learn about the progressive nature of addiction. 4. Recovery is a marathon, not a sprint. Journey To Recovery emphasizes the importance of sticking with the treatment plan and following through with the entire continuum of care. 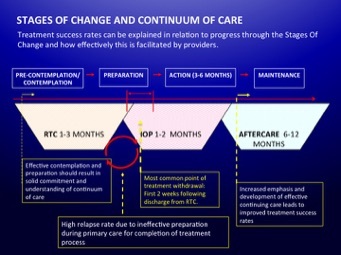 The diagram below shows how the Stages of Change can be used to guide a client through the entire treatment process, and how some of the common pitfalls that lead to treatment failure can be avoided. Journey To Recovery is an eight-week program, after which clients move into an aftercare phase. Clients continue to attend one group per week for a minimum of eight weeks, but may continue to remain involved as they become mentors to newer clients. Individual/family sessions: Scheduled independently, bi-weekly. Medication management (Cherye Callegan, MD, optional): Scheduled independently, as needed. CLICK HERE! for important information about admission requirements. A premiere outpatient substance abuse program for teens—designed for positive results. Adolescent substance use disorder treatment is a highly specialized practice that requires careful attention in many areas to assure the best chance for treatment success. Journey To Recovery represents the best of knowing “what works” and what “doesn’t work” in this critical field, and is based in a rich tradition of helping young people overcome addiction and achieve successful recovery. The number one priority at Journey To Recovery is to provide a safe and positive environment for young people that promotes self-examination and personal growth. Fun and engaging activities, together with a firm expectation of positive engagement and respect for the group process create a healthy atmosphere that supports recovery. Parents can feel confident that their child will not be exposed to negative influences or be in a group that is not invested in recovery. At the heart of Journey To Recovery is an innovative treatment curriculum that combines evidence-based treatment models with a uniquely creative approach, making this one of the most effective substance abuse programs available. Journey To Recovery provides one of the most comprehensive family components for adolescent substance abuse treatment available. In addition to traditional elements such as multi-family groups and family therapy sessions, the program includes a dedicated parent support program that is specifically designed to improve treatment outcomes by teaching parents how to avoid common pitfalls associated with teen recovery. For best treatment results, parents of kids in residential treatment can begin the parent program prior to discharge; this provides the added benefit of maximizing the residential treatment experience and being better prepared for the transition from inpatient to outpatient care. One of the biggest challenges with teens in early sobriety is being able to have fun with a safe crowd that is supportive of recovery. Journey To Recovery provides the opportunity for clients to participate in activities that are structured to promote fun in recovery, but also reinforce work they are doing in treatment. This includes play productions, wilderness retreats, on-site support meetings, social outings, and more. One of the most critical aspects of substance abuse treatment is keeping the client involved in the treatment process long enough for recovery to become a genuine lifestyle. Yet this remains one of the biggest challenges with today’s treatment models, particularly with adolescents. Journey To Recovery employs a unique strategy that gets kids excited about being in aftercare, builds their self-esteem, and succeeds in keeping them involved on a long-term basis. 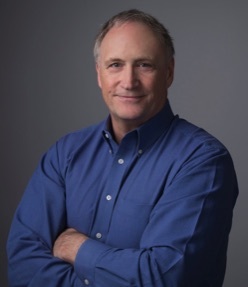 * Adolescent outpatient treatment: Jim's extensive experience of working with teens on an outpatient basis has led to specific understanding of what goes into successful treatment at this critical level of care. * Parent education: Jim is the author of Rehab Works! A Parent’s Guide to Drug Treatment, and presents nationally on what parents can do to give their child the best chance for treatment success. Jim's work with parents is specifically aimed at improving treatment outcomes by helping parents navigate the road to successful recovery for their child. The separate dedicated parent component of Journey To Recovery is a unique feature found in no other programs. * Performing Arts: In addition to his clinical skills, Jim is an accomplished professional musician and producer who has made a career of using the creative arts to make substance abuse treatment a fun and enriching experience for young people. From rock musicals and theatrical productions in which teens act out their own stories of recovery to the unique multi-media online curriculum format that includes music videos and fun storytelling presentations, Journey To Recovery is unparalleled when it comes to creativity combined with clinical sophistication. Cherye Callegan, MD, serves as Medical Director of Journey To Recovery. Dr. Callegan is one of the most experienced and highly regarded addiction psychiatrists in Dallas-Fort Worth area. She specializes in working with teens and young adults, and is known for her commitment to her patients and their families.